On Your Knees Cave (site 49-PET-408) is located at the northern tip of Prince of Wales Island near Sumner Strait. 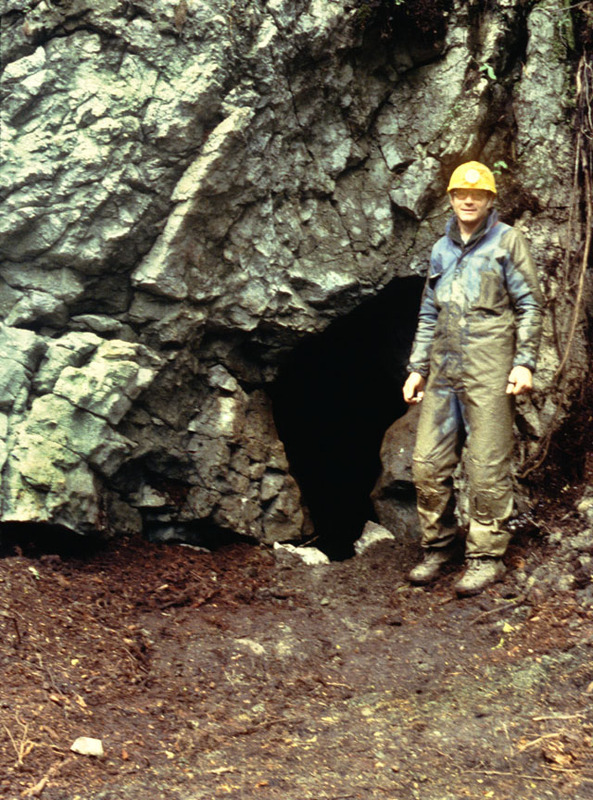 It was discovered in 1993 during a logging unit survey and mapped by members of the Tongass Cave Project. The cave is about one km from the coast and about 125 meters above sea level, and it is located along a ledge on the south-facing side of a deep valley. The cave has a small entrance room (2 meter diameter), which was partly blocked off by a large pile of rock and soil that had fallen from the cliff slope above. 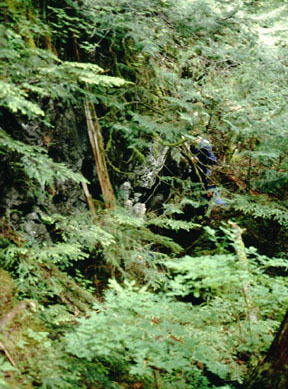 The original entrance was one meter in diameter and difficult to find under the dense forest vegetation (see photos below). The cave itself consists of two horizontal crawlways, each about 30 meters long. Prior to excavation these crawlways were very tight and difficult to negotiate. The left branch, named the Bear Passage, consisted of two small rooms separated by a tight spot. A small spring emerges in the Second Room and forms a stream that continues down the remainder of the Bear Passage, which is a very tight bedrock passage. The right branch, named the Seal Passage, loops around to a second entrance (Ed's Dilemma). Originally this crawlway was so tight that there was no room to turn around in its entire length, and even wearing a helmet was difficult in places. 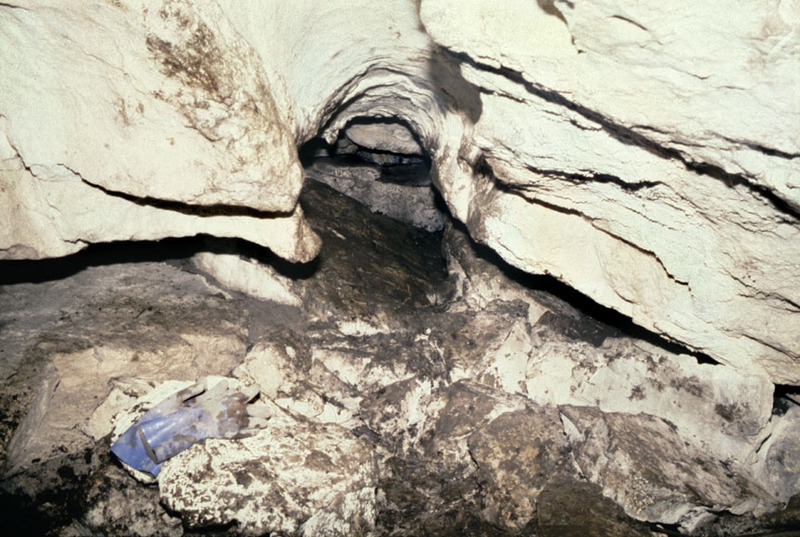 Entrance of On Your Knees Cave when first visited by Dr. Heaton in 1994 (left) and following restoration of the site at the end of the 2000 field season (right). The Bear Passage viewed from the entrance room (below). 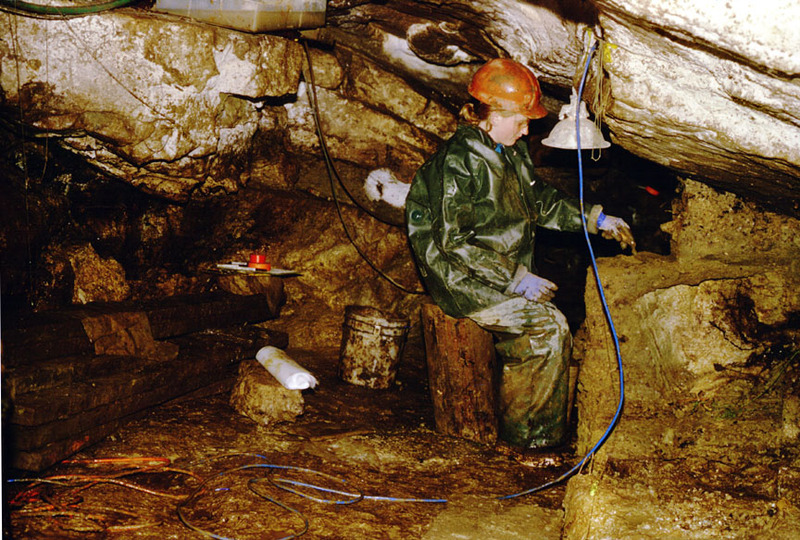 Dr. Heaton first visited the cave in 1994 with Kevin Allred to investigate several bones exposed in the sediment. Samples of brown bear, black bear, otter, and fish were collected. At first On Your Knees Cave seemed less significant than other sites because the bones were few and fragmentary (compared with the complete bear skeletons at El Capitan and Bumper Caves). But the first bone dated from the site (a brown bear femur) was reported to be 35,365 radiocarbon years old--which was three time older than the oldest bones dated from other sites and predated the Last Glacial Maximum. A second bone (a black bear tibia, shown below) was dated to 41,600 years old. 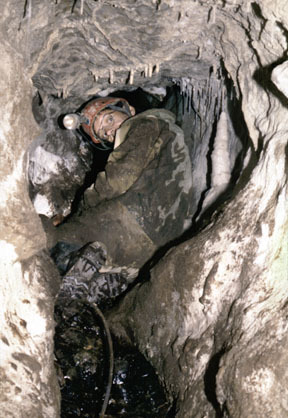 Another exploratory trip was made to the cave in 1995 by Dr. Heaton, cavers, and Forest Service personnel. In 1996 Dr. Heaton and Fred Grady received a grant from the National Geographic Society to begin excavating the site. 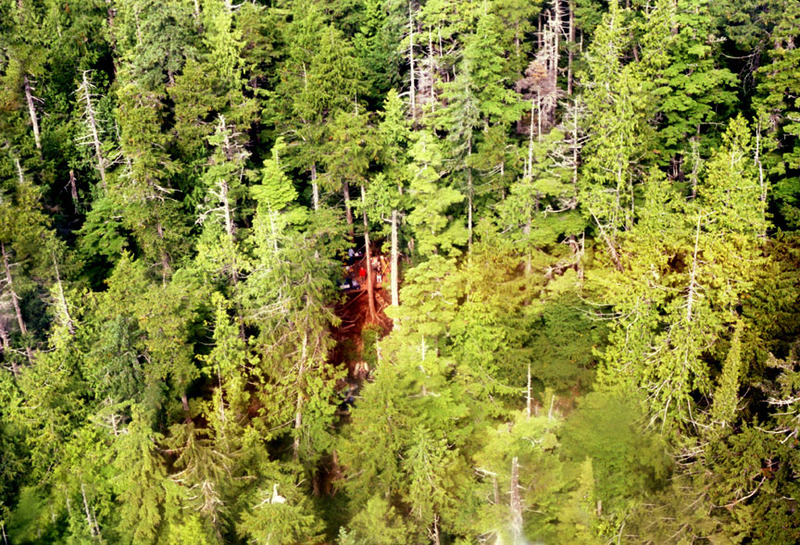 The crew was flown by Forest Service helicopter to a coastal camp site on Sumner Strait, and a crude trail was constructed to the cave. Grid systems were established in the First and Second Rooms of the Bear Passage, and sediments were systematically removed and packed to the ocean for washing using mosquito net bags. Bones were found in abundance in both organic and inorganic sediments. 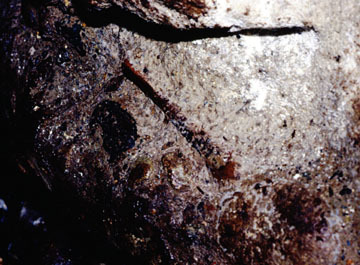 A stone spear point was found in the First Room by Grady in the early days of the 1996 field season, but was considered to be an isolated find. On the last day of the excavation (July 4th) as Dr. Heaton was filling the last bag of sediment in the Second Room, he found the lower jaws, pelvis, and bone tool of a human. 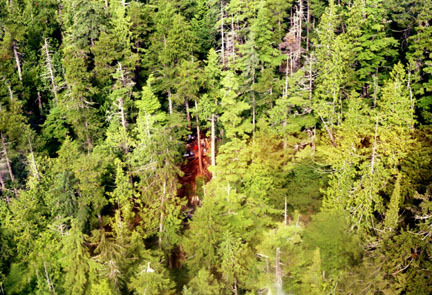 Forest archaeologist Terry Fifield met with local Tlingit groups, and they passed resolutions allowing for the study of the remains and for excavation to resume the following year. Dates of 9,730 and 9,880 years BP were obtained on the human remains, making them the oldest ever found in Alaska or Canada. The associated bone tool was dated to 10,300 years old. 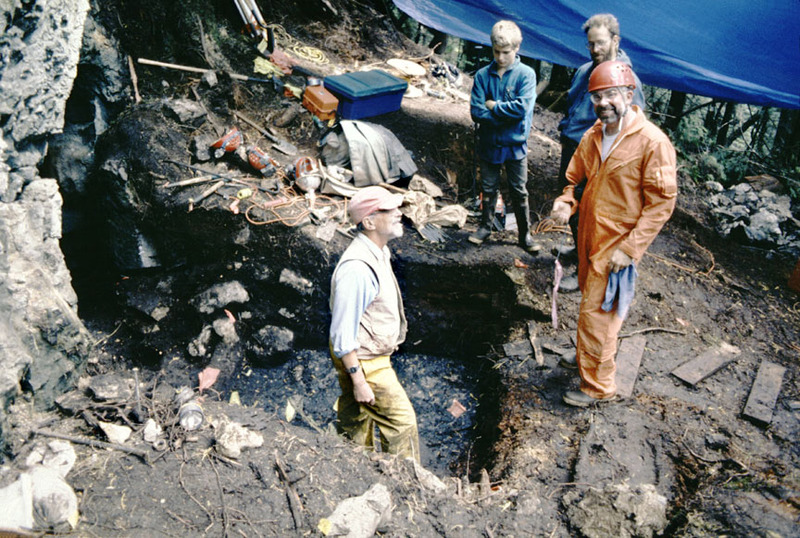 Fred Grady working deep in the Bear Passage (left), and early excavation in the Second Room of the Bear Passage (above). Note how the sedimentary layers tilt down to the right into a hole where a spring emerges. This is the same location where most of the human remains were found the previous year. 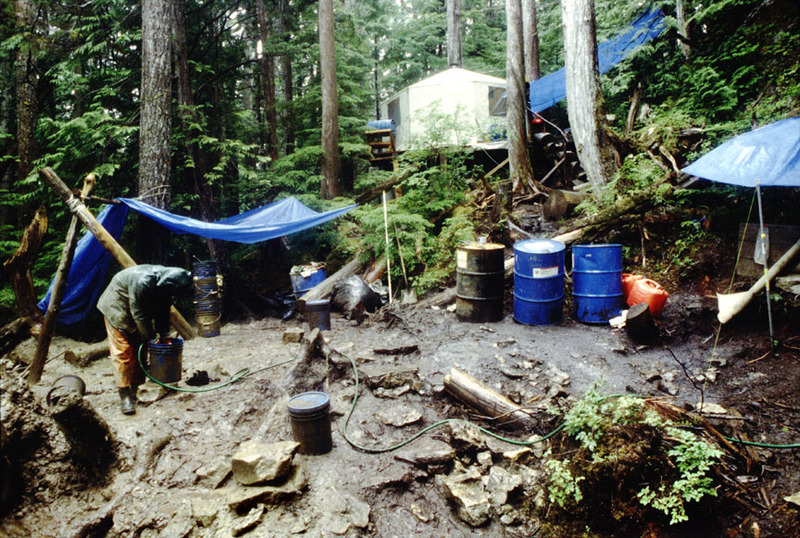 Dr. E. James Dixon, who had been investigating human history in Southeast Alaska, joined the project in 1997 as the Principal Investigator of Archaeology and was awarded a grant from the National Science Foundation to fund the joint research. 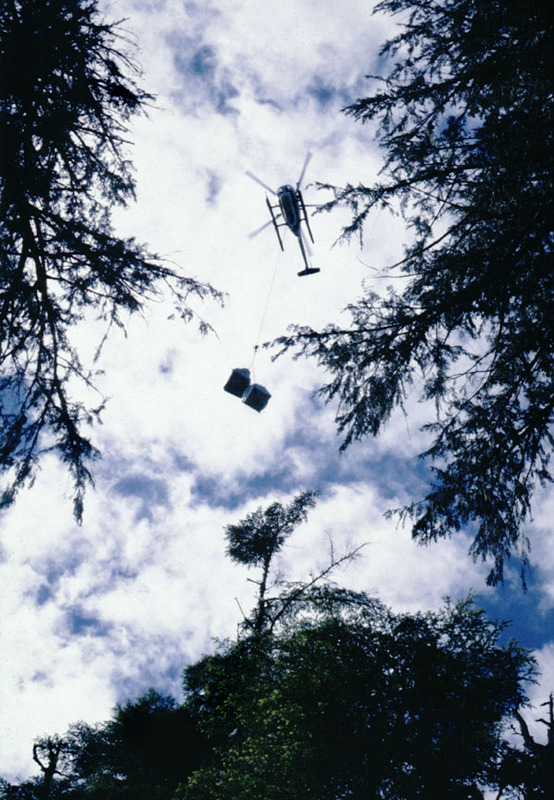 Improvements to the site were made by the Forest Service, such as the construction of a platform for a kitchen/office tent, opening of a hole in the forest for helicopter supply drops, and improvements to the trail from the beach. Rainwater was collected with tarps for cooking and washing sediment, and a generator was used to power lights in some parts of the cave (see photo at right). This greatly improved the efficiency of the excavation. In subsequent years Dr. Heaton and Dr. Dixon were awarded additional grants from the National Science Foundation and the National Geographic Society. 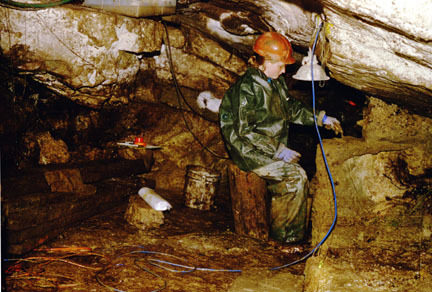 Long summer field seasons were conducted from 1997 until 2000, when the excavation was completed and the cave site restored. The On Your Knees Cave camp as seen from onboard a Hughes 500 helicopter (above), and the same helicopter sling loading supplies to the camp at the beginning of a summer field season (right). Dr. Dixon's crew excavated a trench running from the cave entrance across the platform. In the process they exposed a stratigraphic column that records the history of deglaciation and forest development. At the boundary of the organic and inorganic levels they discovered a cultural horizon containing fire-cracked stones and a wide variety of stone tools and fragments, showing that these tools were both constructed at this site. Even the broken base of the spear point found previously inside the cave was recovered! As the entrance was excavated it was found to open in a bell-shape, suggesting that it was much larger in the past and may have been visible from a great distance prior to the development of the forest. Ancient people may have come to this site for shelter, to hunt hibernating bears, or some other unknown purpose. 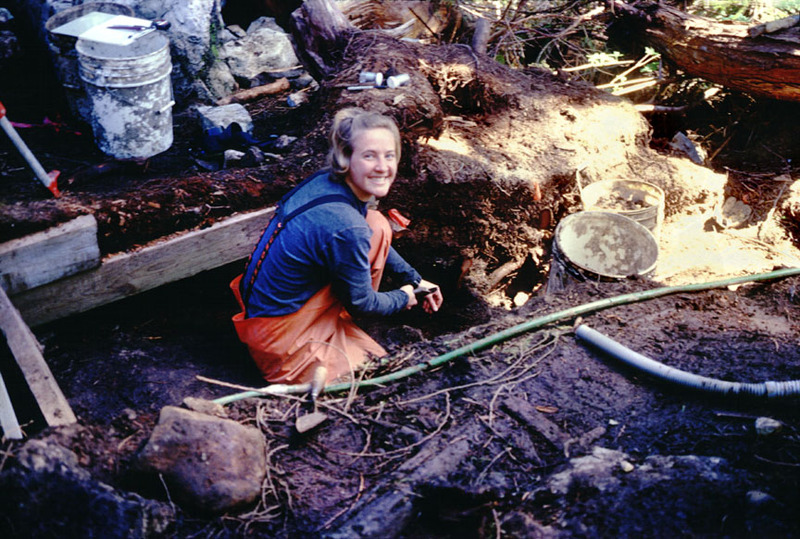 Tongass National Forest archaeologist Terry Fifield (in orange above) examines the trench during the early phase of excavation, and Heidi Manger continues the meticulous work two years later (right). Dr. Heaton and his crew continued the excavation inside the cave, eventually enlarging some of the crawlways into spacious walkways (see photo of Janna Carpenter excavating in the Bear Passage at right). When the archaeological and paleontological excavations approached each other, a boundary was established that was humorously called the "Heaton-Dixon Line." Inside the cave the postglacial organic sediments were very thin (usually less than 10 cm) and bioturbated, so they contained a mixture of old and young bones as well as microblades and other artifacts. But beneath this surface layer were extensive inorganic sediments containing a rich fauna of mammals, birds, and fish dating to the Last Glacial Maximum and the preceding interglacial interval. Large bones and teeth were mapped and then individually cataloged, while smaller remains were recovered when the sediments were screen washed outside the cave and searched under magnification in the laboratory. The sediments remained rich in bone all the way to the bedrock floor. During the five summers of excavation 5,985 gallon-size bags of sediment were excavated and washed, and over 32,000 fossils have been individually cataloged and identified so far. Species recovered include brown and black bear, caribou, Stellar sea lion, ringed and harbor seal, arctic and red fox, hoary marmot, brown lemming, heather vole, and a variety of sea birds such as auks, puffins, and diving ducks (see section on Research Results). The cave has served as a carnivore den by bears, foxes, and otters. Foxes were the main accumulators of mammals and birds, while otters were the main accumulators of fish and invertebrates (marine snails, clams, crabs, etc.). 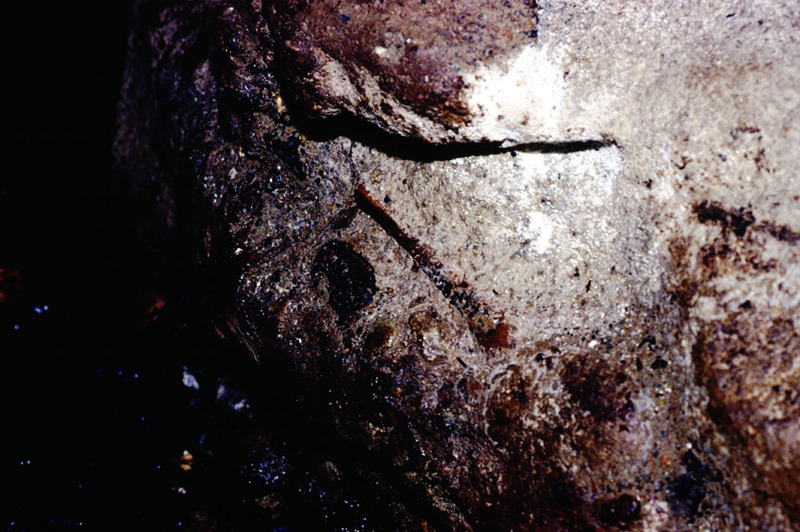 This stalagmite (in front of pool above and at right) has two growth phases separated by a tipover event, and bear bones are incorporated between the two. While excavating into the deeper sediments of the Second Room of the Bear Passage, a layer of gravel and cobbles was encountered. At the top of this gravel a stalagmite was uncovered in its upright growth position (see photos above). When it was removed, it was found to be attached to a second stalagmite tipped on its side, and between these two growth phases were parts of several bear bones. Nearby in the gravel, other bear bones were found that were coated in dripstone. 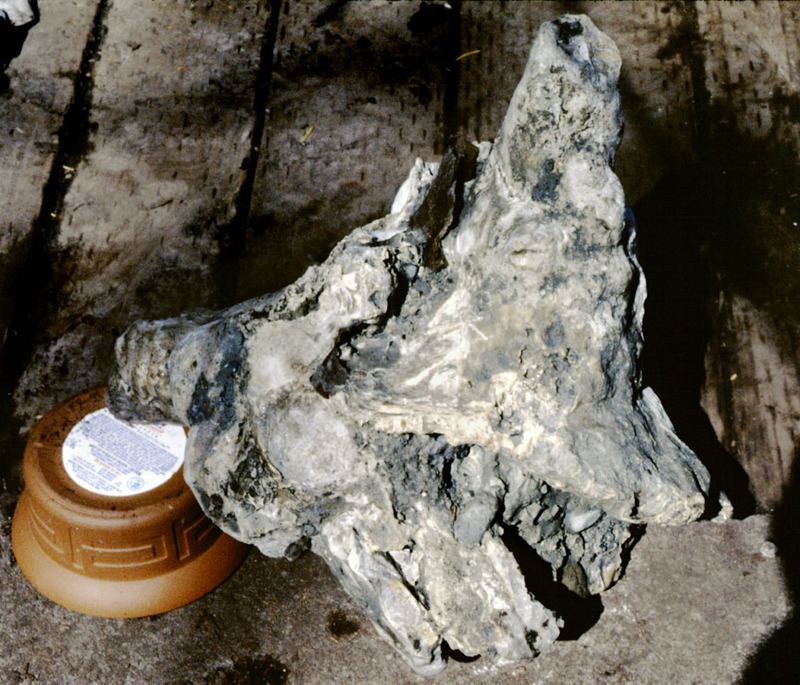 Since these objects were found downstream from a spring, the following scenario can be surmised: 1) dripping water from the cave ceiling formed a stalagmite on the gravel floor next to the stream, 2) the stream eroded the floor sediment and undercut the stalagmite, causing it to tip over, 3) a bear died in the cave, and its bones lay scattered about the room (maybe the bear tipped the stalagmite over! ), 4) dripping water formed a new stalagmite in the same spot that covered the old stalagmite and the bear bones, and 5) subsequent sedimentation covered the entire stalagmite and associated bones with a thick layer of silt. Sediments in the Second Room of the Bear Passage (above) were locally stratified and may have been deposited by the same stream that flows through that room today. 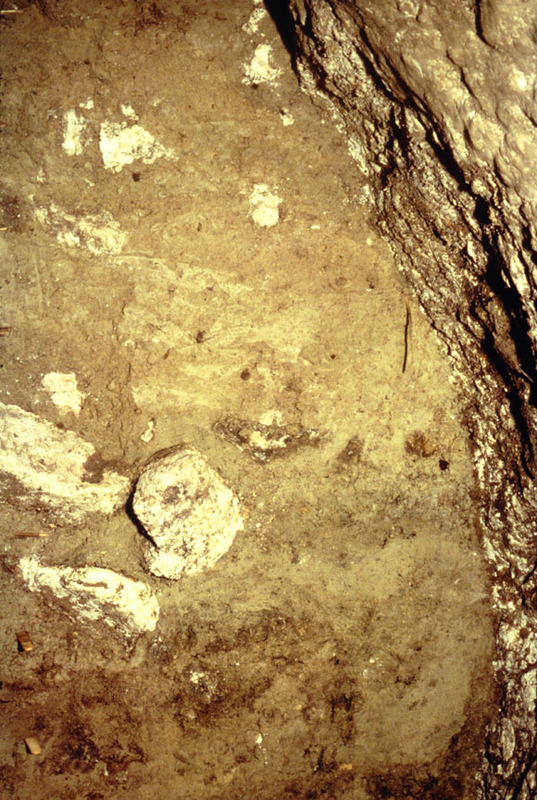 Sediments of the Seal Passage (right) were a more uniform mix of silt, sand, and pebbles with occasional white rocks from ancient roof fall. 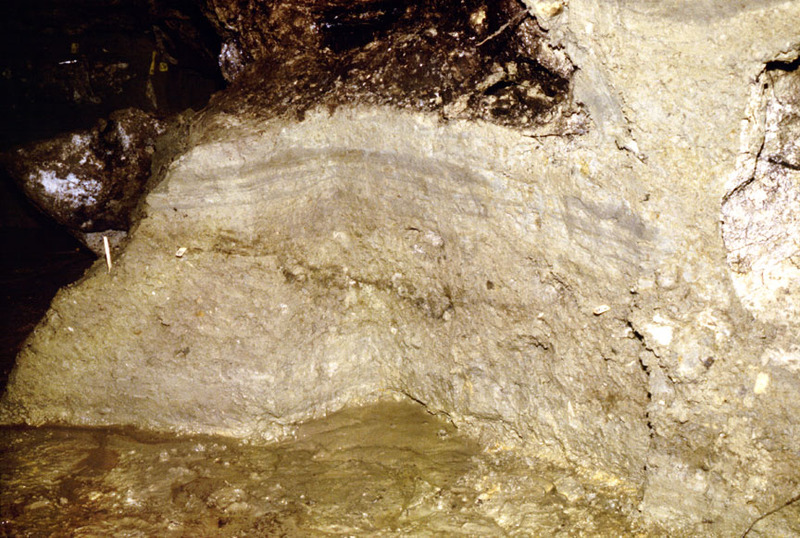 The sediments of On Your Knees Cave are unique and fortuitous for fossil preservation. Carnivores accumulated the bones in this den site, which demonstrates that the cave has been accessible for most of the last 50,000 years. Glacial sediments then accumulated (reworked in some cases by water) to bury and preserve the bones. However, a cave filled with water or ice would not make a suitable den. 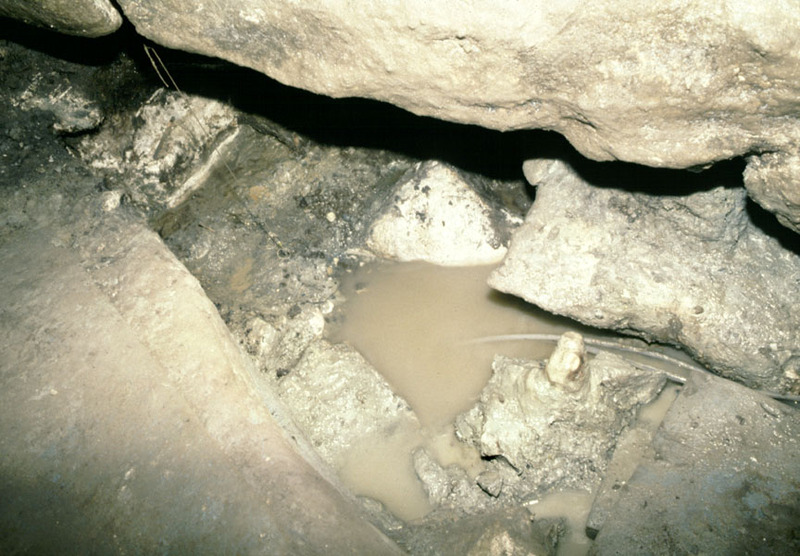 The passages of the cave are nearly horizontal, and there is no apparent source of glacial sediment uphill from the cave. The mechanism by which poorly-sorted glacial sediments were carried into these passages, filling them almost to the ceiling and preserving delicate fossils in the process, is poorly understood. Some fossils date to the Last Glacial Maximum, when glaciers would be expected in the area, but most date to the preceding interglacial interval. Paradoxically, it appears that bone accumulation and burial occurred simultaneously (or in repeated succession) throughout this entire interval of time. A detailed study of the distribution of fossil rodents in the sediments is currently underway to resolve this puzzle. Dr. Heaton traverses "Hamilton Log" on the trail between the beach camp and On Your Knees Cave (left). 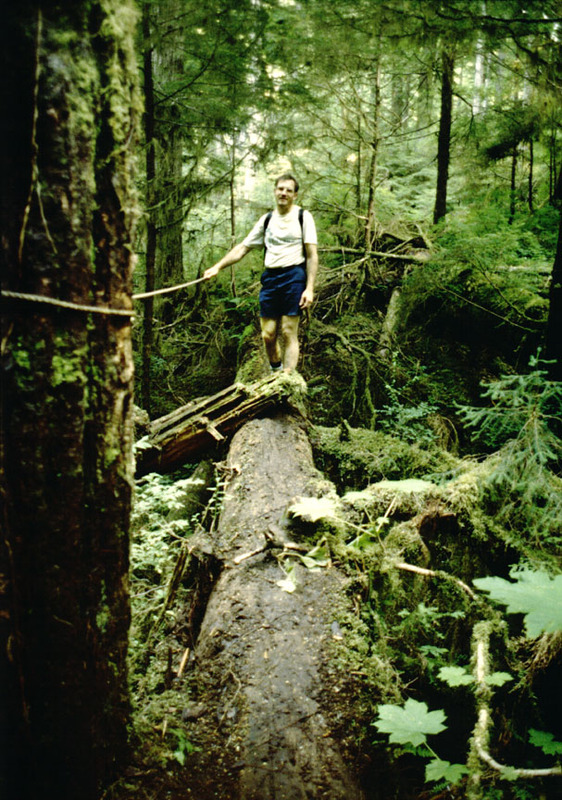 A handline was rigged across this log (which spans a creek) after geologist Tom Hamilton fell and broke a rib in 1997. 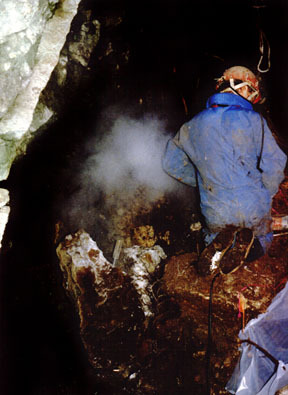 Caver Pete Smith (right) looks away while he fires a small shell to break up a boulder that was inhibiting excavation. The crew at the On Your Knees Cave excavation generally consisted of 10-20 people, including the principal investigators, students from South Dakota and Colorado, native Tlingit and Haida interns, Forest Service personnel, visiting scientists, and local volunteers. 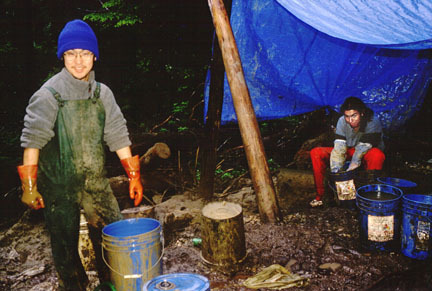 (The native interns were funded in 1997 by Dr. Dixon's NSF grant and in 1998 and 1999 by the Sealaska native corporation.) The main activities of the crew included excavation inside and outside the cave, screening sediments and searching them for bones, and various camp duties. 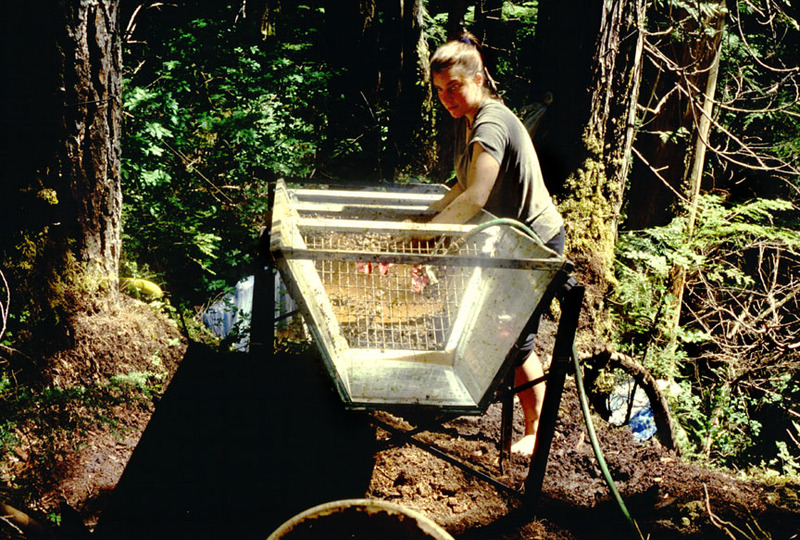 Much of the screening of sediments was done using mosquito net bags in buckets of water. This method proved very useful for breaking down clay and recovering delicate rodent teeth. 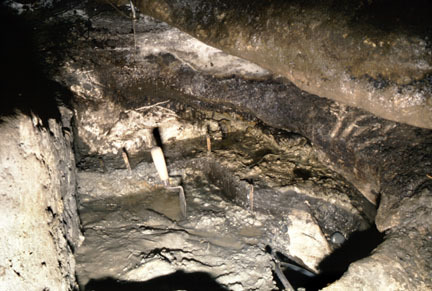 In later years of the excavation, the archaeologists constructed a screening trough with a recycling water system. This proved very useful for processing large volumes of organic sediment and recovering small stone tools. Many of the best discoveries were made during the screening process. Kei Nozaki and Zach Evans screening bags of sediment under a tarp on a typical rainy day (left), and archaeologist Heather Mrslack running the screening trough on a sunny day (right). Local Alaskans from the villages of Port Protection and Point Baker made frequent visits to the cave to see the excavation, and they also welcomed the crew into their communities and provided the camp with delicious salmon and many other treats. Dr. Dixon and Dr. Heaton made several slide presentations in both communities which were always well attended. In spite of the remote location of On Your Knees Cave, there was enormous media interest in the excavation. 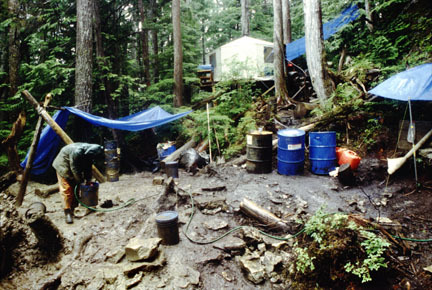 In 1998 the camp was literally inundated by film crews, authors, and news reporters. 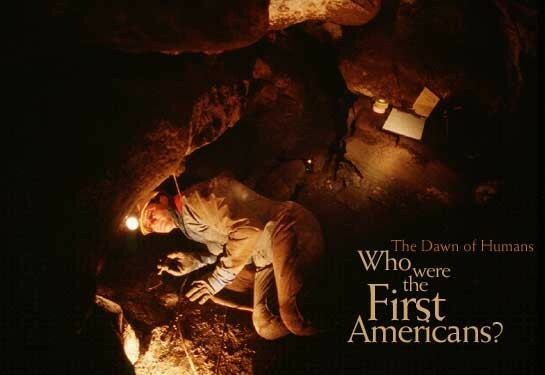 The excavation was featured in the NOVA program Mystery of the First Americans (March 1999) and the National Geographic article Hunt for the First Americans (see photo below) among other places. The reason for this publicity is the supporting evidence that both the archaeology and paleontology of the site provide for the Coastal Migration Theory of the peopling of the Americas. This photo of Dr. Heaton by Ken Garrett is courtesy of the National Geographic Society Web Site and was published in the December 2000 issue of National Geographic Magazine, page 40-41. 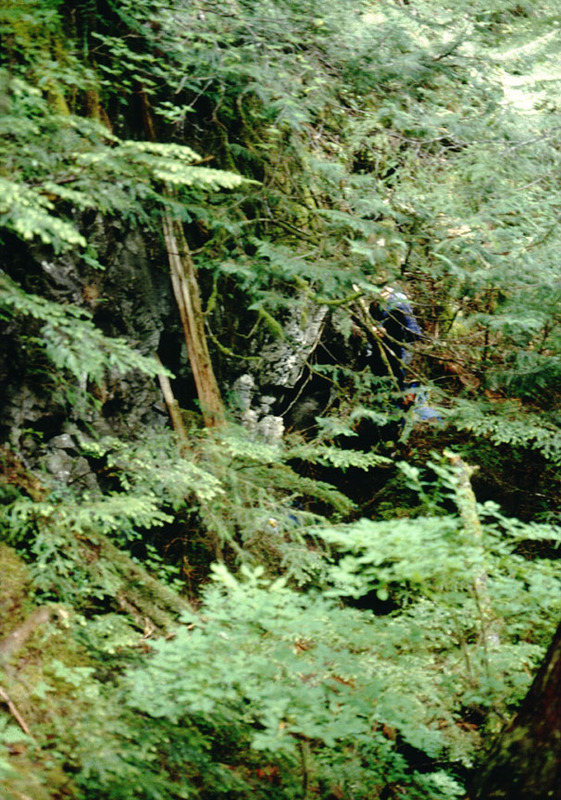 It was taken in the Second Room of the Bear Passage where the human remains were found. During seven years of field work at On Your Knees Cave, the excavation never stopped revealing curious and interesting surprises. 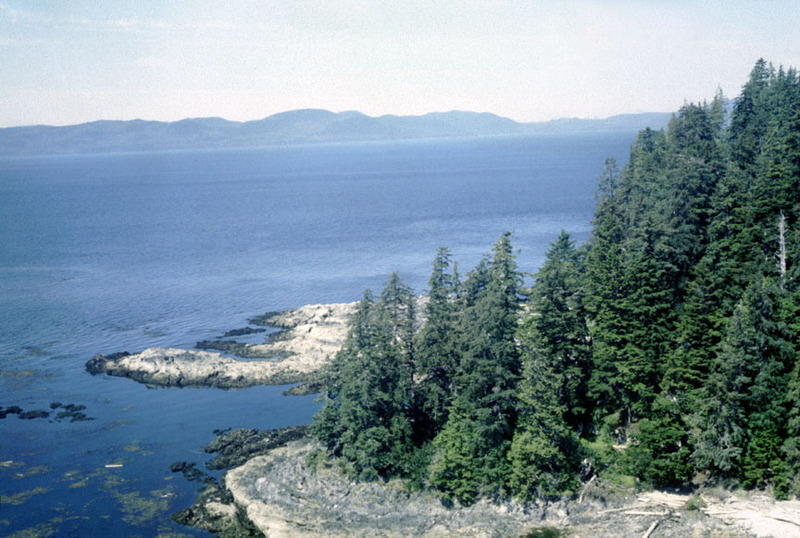 It is unrivaled as the most significant archaeological and paleontological site in Southeast Alaska, and as such is the basis for most of the Research Results discussed on this site. The collections made at this cave are enormous and will be under study in the laboratory for years to come.